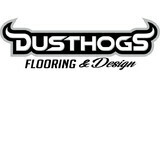 Dusthogs removes your tile DUSTFREE! The reason for using Dusthogs to remove your tile DUSTFREE is because if you haven’t ever had tile removed before you don't know the horrible mess that it creates. The dust that is generated while removing tile when NOT being done with our specialized equipment is extremely dusty. It gets in and on everything in your house and can take weeks, months even years to get rid of. It is a fine powder dust that even sticks to the paint on your walls. Also, the chemical that is in that dust is linked to lung cancer. Using Dusthogs is the best and healthiest way to have your tile removed. Dusthogs is the only company in the state of Arkansas and surrounding areas with our specialized equipment for removing ceramic/porcelain/stone tiles DUST FREE! We guarantee your house to be as clean or cleaner than when we arrived. We also remove tiled walls including tiled showers, kitchen backsplashes and fireplaces. We can remove up to a 1,000 sqft of tile in a single day allowing you to move quickly through the process of updating your current floors. 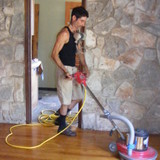 We also remove glued down engineered wood floors with our ride on battery powered floor scraper. We can removed up to 1,000 sqft in a single day! We can remove all other flooring as well including carpet glued or padded, vct, LVP, sheet vinyl, nailed down wood floors etc. *Authorized Shaw Flooring Dealer* We are a family-owned business, operating since 1945! Our latest location has been here since 1991. We are here to help with all your flooring needs. We have over 100 years of combined flooring experience! We service the Northwest Arkansas area, including: Rogers, Bentonville, Springdale, Fayetteville, Siloam Springs, and more! Contact us to learn more! 20 years experience. Artisan/Owner. Solid hardwood flooring installation, sand and finish, repair, restoration, remodels. Pier and beam repair, foundation repair. Restoration and antique hardwood specialist. We are a Fayetteville Family Owned and Operated Business serving NWAR since 1994. We specialize in custom installation and finishing of strip and plank wood flooring. We proudly feature dustless sanding and refinishing. We carry all species including Bamboo and Cork. Come visit our showroom or call us for a free estimate. Family owned and operated since 1947. We specialize in all types of floor covering and are the TRUE leader for your new floor needs. We are in the same location in downtown Joplin where we began over 70 years ago! No one else has the history or reputation of Smith's Floor Store. At Smith's we pride ourselves in offering the best in products, service, and installation. We only show name brand first quality products so you don't have to worry about being sold a floor that looks good today and worn tomorrow. When you are looking for the right place to go and trust with your home...there is only one name to know - Smith's Floor Store! Because you don't want just any floor....you want a Smith's Floor! Combining years of experience with a dedication to client satisfaction, Flooring USA has established itself as the local leader in Commercial Flooring, Residential Flooring and Floor Covering Installation. We make and sell unique solid wood flooring, paneling, and trim from local hardwood harvested in Missouri and Oklahoma. We are a professional hardwood flooring contractor. We specialize sand and finish install and refinish. We also do actual handscraped hardwood floors (not prefinished handscraped). But we will install prefinshed wood also. We are hardwood flooring experts. From installation,borders designs, and inlays, to refinishing. If it is hardwood flooring related we most likely do it. What kinds of services do hardwood flooring installation professionals in Cleora, OK provide? Find hardwood floor experts in Cleora, OK on Houzz. Search the Professionals section for Cleora, OK hardwood flooring installers and dealers or browse Cleora, OK photos of completed installations and look for the professional’s contact information.